Asia is the world’s largest e-commerce marketplace. In South Asia, India has the largest e-commerce market at $33 billion in 2017. Maldives, Bhutan, and Sri Lanka lead the subregion in terms of percentage of the population with access to the internet. This report introduces a framework for analyzing the quality of e-commerce development in the Asia-Pacific region and discusses lessons learned regarding e-commerce development. The framework incorporates economic factors, institutional environment, and social acceptance to assess e-commerce development and suggest the way forward. Policymakers face complex and challenging tasks to develop clear, sustainable, and achievable pathways for South Asian countries and the rest of Asia-Pacific to achieve the Sustainable Development Goals for energy (SDG7). This report provides an analysis of what can be achieved under current policies. It then identifies gaps and presents transition pathways to assist policymakers to make informed decisions for achieving SDG7 targets. This report, developed by United Nations Economic and Social Commission for Asia and the Pacific in cooperation with the Asian Development Bank, reviews the major challenges in achieving energy access, efficiency, and renewable energy objectives at the regional and country levels. It looks at the growing support for regional connectivity as well as technical and political challenges to furthering cross-border power trade. This issue of the United Nations Economic and Social Commission for Asia and the Pacific (ESCAP) newsletter covers the fifth Asia-Pacific Forum on Sustainable Development and its calls for greater regional collaboration. It also features a report on how digital trade facilitation could cut trade costs in Asia-Pacific by $673 billion annually. This book reviews issues concerning the roles of services in global value chains. It presents a framework for assessing links among different services and between services and the manufacturing sector. The book explains the contribution of services to global value chains in the Asia-Pacific region and to the world and also draws lessons with which countries could understand the importance of services and participation in global value chains to achieving sustainable development. This report examines challenges and opportunities that underpin regional cooperation and integration in Asia and the Pacific. It gives recommendations on how to lay the foundations for market integration, seamless connectivity, and financial cooperation, and address shared vulnerabilities. It also looks at how cooperation in South Asia in such areas as energy and infrastructure financing could be enhanced to help address poverty and other issues. This report provides analyses of trends and policy developments in trade in goods and commercial services in Asia-Pacific. It shows that merchandise trade remained subdued in 2016, with South and Southwest Asia accounting for 8% of Asia-Pacific exports and 12% of Asia-Pacific imports. Foreign direct investments inflows In South and South-West Asia decreased slightly by 4% to $66 billion in 2016. The report also argues for targeted trade and investment policies that strike a balance between economic development and social and environmental development. Paperless trade reduces trade costs and enables trade to drive growth and sustainable development. This report shares results of the global survey on trade facilitation and paperless trade implementation, covering 44 countries in Asia and the Pacific. It covers 47 trade facilitation measures, including those involving general trade, paperless trade, cross-border paperless trade, transit, and trade for small and medium-sized enterprises. The report gives an overview of trade facilitation implementation in South and Southwest Asia, and includes Bangladesh, India, and Myanmar in its analysis of transit measures in Asia and the Pacific. The ESCAP Newsletter is a monthly recap of the events and other activities of the United Nations Economic and Social Commission for Asia and the Pacific (UNESCAP). This issue highlights the ASEAN-India partnership and how it could benefit the Asia-Pacific region. Dr. Shamshad Akhtar, Executive Secretary, UNESCAP, talks about the importance of sustainable development and regional cooperation and integration. The issue also features a story on strengthening technical cooperation between UNESCAP and Myanmar. This report investigates the evolution of trade costs, examines trade facilitation and paperless trade implementation, and highlights key initiatives in South Asia, including efforts by members of the South Asia Subregional Economic Cooperation (SASEC). The SASEC Trade Facilitation and Transport Working Group agreed to expand assistance to trade facilitation through technical assistance to support more efficient, transparent, secure, and service-oriented processing of cross-border trade across South Asia. Through 2025, the SASEC connectivity agenda will be better aligned with the frameworks of South Asian Association for Regional Cooperation and the Bengal Initiative for Multi-Sectoral Technical and Economic Cooperation. To help establish a trade and transport facilitation monitoring mechanism, Bangladesh, Bhutan, and Nepal conducted studies that reviewed trade and transport procedures, analyzed bottlenecks, and gave recommendations on trade and transport facilitation. This report gives an overview of assessments from the 2017 global survey on trade facilitation and paperless trade in Asia and the Pacific. It looks at the implementation of trade facilitation and paperless trade measures in 44 countries in Asia and the Pacific, including how the South Asia Subregional Economic Cooperation Trade Facilitation Strategic Framework promotes development by deepening regional cooperation. The Framework covers national and subregional projects in Customs harmonization, improving cross-border facilities, and transport facilitation. The Framework also supports regulatory reforms and the development of the National Single Window Customs management system in Bangladesh, Bhutan, Maldives, and Nepal. In 2015, 150 countries set in motion the most ambitious development agenda of our time, the 2030 Agenda for Sustainable Development. Asian countries have begun translating this agenda into action through national plans and programs. However, to fully achieve the Sustainable Development Goals, countries need to examine opportunities for regional cooperation to complement the effectiveness of national mechanisms in the areas of finance, technology, capacity-building, and trade. Discussion through regional and subregional organizations can help facilitate cooperation in these key areas. Myanmar strategic position connects Asia’s three big markets—Association of Southeast Asian Nations, China, and India. Since 2011, Myanmar has laid down economic reforms that are unlocking the country’s potential. This working paper discusses Myanmar’s participation in regional partnerships, such as the South Asia Subregional Economic Cooperation, which it joined in 2017. It argues that such partnerships are essential in building Myanmar’s infrastructure and speeding up its growth. The connection between trade and internet governance presents complex policy challenges in today’s digital economy. This working paper highlights several observations and findings on the complex relationship between international trade and the internet. It recognizes the fact that the internet is not only driven by economic factors, but is a complex phenomenon shaped by political and social engagement, technical efficiency, and cultural and moral considerations. It sees the importance of synergizing international trade and the internet, and recommends that the World Trade Organization and other trade institutions develop mechanisms to consult internet governance institutions such as the Internet Engineering Task Force, World Web Wide Consortium, Internet Corporation for Assigned Names and Numbers, International Telecommunications Union, Internet Society, and the Internet Governance Forum. Asia-Pacific Research and Training Network on Trade (ARTNeT) is an open regional network composed of leading trade research institutions and think tanks across the Asia-Pacific region. The 2017 July issue of its newsletter features the benefits Sri Lanka could reap from its free trade agreement with India and the shaping of the digital trade agenda. The ESCAP Newsletter is a monthly recap of the key events, publications and other activities of the United Nations Economic and Social Commission for Asia and the Pacific (UNESCAP). It highlights the key issues that the UNESCAP works on and how the organization works to support member states in reaching the objectives of the Sustainable Development Goals (SDGs). This issue highlights the 73rd Commission Session of Asia-Pacific leaders on "Regional Cooperation for Sustainable Energy," which culminated with the adoption of resolutions advancing transport connectivity and sustainable energy development. South Asia needs to address development gaps in terms of transport infrastructure, energy, and basic services. The 2030 Agenda for Sustainable Development and its 17 Sustainable Development Goals (SDGs), if pursued decisively, could transform South Asia by bridging these gaps and addressing economic, social and environmental challenges in the region. This report offers tangible means to mainstream the SDGs through national development plans and programs. It outlines seven key policies that could create conditions for sustainable prosperity through regional cooperation and other strategies and demonstrates how a sustainable industrialization strategy could generate 56 million new jobs in South Asia by 2030. This report on performance and monitoring of two corridors, the Kolkata-Phuentsholing corridor and the Burimari-Phuentsholing corridor is the sixth of a six-part study on Trade and Transport Facilitation Monitoring Mechanism (TTFMM) in Bhutan. The study finds that average speed along the corridor is very low. Along the Kolkata-Phuentsholing corridor, average speed with delays is 9 kilometers per hour (km/h) and without delays is 15 km/h. Along the Burimari-Phuentsholing corridor, average speed with delays is about 5 km/h and without delays is 16 km/h. The challenges to ensuring efficient transport along the corridor remain significant, yet the study sees tremendous opportunities for improvement, and raises the importance of continuous and effective monitoring to observe whether trade and transport performance along the corridor improve over time. This Time Release Study report undertaken at Phuentsholing Land Border Crossing Station in Bhutan is the fifth of a six-part study on Trade and Transport Facilitation Monitoring Mechanism (TTFMM) in Bhutan. According to the study, the average time taken for clearance of import goods from India is 58 minutes for taxable goods and 28 minutes for non-taxable/exempted goods. Imports from third countries take around 16 hours for taxable goods and 7 hours for non-taxable/exempted goods. Export of goods to India and third countries follow the same procedure, with around 13 minutes on the average needed to clear export goods. Specific recommendations are given to further enhance the efficiency of clearance of goods at the borders, including conducting the TRS on a regular basis. This business process analysis report on the import of light motor vehicles (LMVs) from third countries to Bhutan via Kolkata Port is the first report of a series of a six-part study on Trade and Transport Facilitation Monitoring Mechanism (TTFMM) in Bhutan. Study findings reveal it takes 28.5 days to import LMVs from the Republic of Korea, with costs amounting to around $1,289 to complete the import procedures, not including the applicable duty and taxes payable in Bhutan. 39 documents are needed to complete the import process, with 12 documents requiring extra copies. Specific recommendations are given to improve trade in this commodity. Most regional trade agreements now feature one or more measures for electronically exchanging trade-related information. These measures are becoming essential to maintaining trade competitiveness and enabling effective participation in cross-border e-commerce. This paper examines the extent to which measures enabling paperless trade are included in regional trade agreements (RTAs), such as the Association of Southeast Asian Nations-India Free Trade Agreement. India leads the region with the highest number of RTAs involving paperless trade measures. Asia-Pacific RTAs now increasingly cover specific areas of paperless trade such as electronic certificates of origin and sanitary and phytosanitary certificates. Countries in the Asia-Pacific region face multiple energy-related challenges, which are driving transformation of energy systems. Addressing these energy challenges is an integral part of implementing the 2030 Agenda for Sustainable Development, including ensuring access to affordable, reliable, sustainable, and modern energy for all. This report analyzes challenges in the Asia-Pacific region and its efforts to accelerate the energy transition to achieve Sustainable Development Goal 7. This report explores five long-term trends in the Asia-Pacific region that will shape approaches to poverty alleviation and the prospects for achieving prosperity: regional economic cooperation and integration; rural–urban transitions; demographic changes; ICT access and connectivity; and demand for natural resources. It examines the changing development context in South Asian and other economies. It also looks at opportunities created by regional cooperation and integration that intend to bring about shared economic benefits. At a modest 6% of total trade, intraregional trade in South Asia stands at less than one third of its full potential. Trade barriers and inadequate infrastructure have cost South Asia over US $54 billion per year in lost export opportunities. With 309 million people living on less than $1.90 a day—the largest concentration of poverty in the world—South Asia should urgently pursue broad-based regional economic cooperation that could enable effective responses to the subregion’s developmental challenges. This report examines the state of economic integration in South Asia and identifies potential areas for further strengthening subregional linkages. It provides recommendations on policy actions to increase market integration, improve connectivity, boost investment in infrastructure development, and tackle shared vulnerabilities and risks. It calls for the consolidation and upgrading of existing trade and investment cooperation initiatives into a South Asia Comprehensive Economic Partnership. The 2017 edition of UNESCAP’s Economic and Social Survey of Asia and the Pacific underscores the need to better address the region's pressing challenges due to rising trade protectionism, heightened global uncertainty, and rapid growth in the previous years. Better governance and effective institutions can help Asia and the Pacific countries cope with steady but modest growth and rising inequalities, as well as environmental degradation, by helping them gain access to a skilled labor force, improve investment prospects, and sustain innovation—enhancing their level and pace of productivity, improving their long-term economic prospects. In South Asia, where most households depend entirely on labor income, decent and high-productivity jobs are needed to help mitigate high levels of poverty. The report also highlights the need to manage climate change, which threatens to undermine the region's economic development gains. This issue of Trade Insights, published by United Nations Economic and Social Commission for Asia and the Pacific, discusses how possible Brexit scenarios could adversely affect least developed countries in the Asia-Pacific region. Simulation results show that potential reduction in exports to the United Kingdom for fish, clothes, textiles, footwear, and other key items can range from 16% to 50% of their current export value. According to the study, countries heavily exposed to Brexit-induced risks must analyze the extent of such impact and engage the United Kingdom in discussions in order to limit negative impact. As countries begin to depend on more each other, trade policy is helping achieve inclusive and sustainable development. Trade and investment are linked to the environment and social issues, and countries now realize that cooperation is necessary in approaching global and regional problems. The Asia-Pacific Trade Agreement (APTA), the oldest preferential trade agreement in the region, helps promote economic development and the adoption of mutually beneficial trade measures. This book gives an overview of the APTA and outlines potential benefits and challenges for members new to the APTA. The book details a possible road map for APTA and suggests that APTA move from the conventional preferential agreement to a comprehensive economic integration agreement by converting to FTAs in goods, services, investment, trade facilitation and non-tariff measures. Rapid economic growth in emerging Asia has led to a critical increase of greenhouse gas emissions. Transitioning to renewable energy sources would help reduce emissions. However, massive investment is needed to make that transition. According to this paper, targeted policy interventions are needed to facilitate trade and investment in the renewable energy sector and create “green jobs” in the low-carbon and resource-efficient sectors. Despite the benefits of energy connectivity, energy trade in Asia and the Pacific has remained far below its potential. This publication takes a detailed and engaging look at how smart region-wide energy connectivity could greatly improve energy supply and address the environmental impacts of energy. It maps existing energy connectivity in the region, examines ongoing initiatives, and suggests regional action plans that could lead Asia and the rest of the world to a sustainable future. Many landlocked countries remain among the world's poorest nations, despite huge political, economic and technological gains over the last two centuries. Their lack of access to coast and sea ports burden them with higher trade costs, constraining their socio-economic development prospects. This paper examines the trade performance of Asian land-locked developing countries (LLDCs), including their export performance and export diversification, and attempts to identify factors affecting their performance, such as cost of trade and trade facilitation measures, which inhibit their integration into global and regional economies. Among LLDCs in South Asia, Bhutan incurs some of the highest trade costs and Nepal faces high cost in transport services. The paper finds persistent challenges to the growth of Asian LLDCs--trade barriers and trade restrictions, lack of infrastructure and poor trade facilitation performance-- and recommends reforms that could mitigate these continuing economic challenges. Information and Communication Technologies (ICT) provides efficiencies that can deliver many advantages for trade and transport facilitation (TTF) including Single Windows, automated business processes, digitalization of procedures, simpler interaction and transmission of data, and faster decision-making abilities. This paper looks at the business needs of TTF and explains the requirements of an architectural model to support TTF, with policy makers in mind. It highlights the need to integrate and modernize ICT systems and architecture so that ICT can respond to the needs of trade and transport facilitation. This paper evaluates the prospects of least developed countries (LDCs) in Asia-Pacific in meeting the target set for LDCs to double their share of global exports by 2020, in Goal 17 of the Sustainable Development Goals (SDG). The paper notes that most Asia-Pacific LDCs have reported strong GDP growth turnout in recent years and are expected to grow by an average of 5.8% in 2016; difficulties faced by individual LDCs vary – Nepal, as an example, would need expansion at the average rate of 19% per year; LDCs can use national SDG strategies and go for longer-term goals—beyond the goals of export expansion—such as aiming to reach targets on trade cost reductions and trade facilitation. This year-end update revises economic growth in developing economies in Asia and the Pacific to 4.5% in 2015, from earlier projections of 4.9%, and updates the economic growth forecast for 2016 to 5%, from 5.2%. In most developing economies, including South and South West Asia, private consumption will lead to a slight pick-up in economic growth in 2016, amid gradual fiscal tightening and weak exports. With less robust growth compared to the years before and immediately after the global financial and economic crisis that started in 2008, the report highlights a need to tap into domestic and regional sources of demand—alternatives to dependence on external demand—including boosting investment in infrastructure, small and medium-sized enterprises, and the agricultural sector. Promotion of labor participation among the youth and the female population in South and South West Asia is also encouraged, since evidence has shown that improving their job opportunities matters for economic growth. This publication highlights post-Bali developments, focusing on the interests of least developed countries (LDCs). It provides evidence and insight of persistent trade issues, which affect LDCs both in national economies and in the multilateral trading system. By underscoring gaps in LDC capacities, it articulates what LDCs need in terms of national and regional policies and capacity-building programs. The study also draws attention to what ought to be done towards finalization of the Doha Development Agenda Work Program and the ongoing negotiations at the World Trade Organization. This theme study outlines a conceptual framework, a set of strategies and policy options, and offers perspectives on institutional frameworks for integrating the three dimensions of sustainable development – economic growth, social progress and environmental protection. Regional cooperation is critical in maximizing opportunities for building synergies between the three dimensions. Initiatives at the regional level should consider establishing a regional road map, supporting regional economic integration initiatives, and strengthening regional platforms, including the United Nations and the multilateral system. This study brings together existing evidence on the occurrence and trade impacts of non-tariff measures (NTMs) in the Asia-Pacific region. It aims to contribute to an improved understanding on their trade impacts on developing countries. The report focuses on the consequences of NTMs for developing economies and South-South trade. The chapters include an overview of tariff and non-tariff measures, an evaluation of NTMs and trade, and an examination of Sanitary and Phytosanitary Measures and Technical Barriers to Trade. Finally, the study concludes by reviewing mechanisms for streamlining NTMs and promoting developing countries’ trade, particularly at the regional level. World Trade Organization (WTO) Trade Facilitation Agreement (TFA) provisions notified under Category A are those that WTO Member States have already implemented or have committed to implement by the time the Agreement enters into force or, in the case of the least-developed countries (LDCs), within a year of its entry into force. Provisions not included under this category are those which will require capacity building and technical assistance, or presumably take longer to implement. This trade insight paper analyzes Category A notifications of 15 economies in the Asia-Pacific region, contrasting the results with findings from an earlier ESCAP Survey on Implementation of Trade Facilitation and Paperless Trade (SITFAP) 2013/14 in order to examine some of the most challenging WTO TFA provisions, and gain insights on regional priorities for cooperation and capacity building. Asia Pacific least developed countries (LDCs) including Bangladesh, Bhutan, and Nepal account for a small but growing share of global exports. In order to integrate further into regional and global economies, a number of countries have introduced Duty-Free Quota-Free (DFQF) schemes for LDCs. This note reviews those schemes and finds that while improved market access through DFQF schemes is useful, developmental benefits will be limited unless the schemes are relevant and useful. This discussion paper published by the South Asia Watch on Trade, Economics and Environment assesses the potential gains of a sub-regional transit arrangement and the removal of other border-trade barriers, particularly the eastern South Asia sub-region (Bangladesh, Bhutan, India and Nepal). It also discusses the link between transit and trade flows, provides profiles of intra-regional transit trade and current transit arrangements in South Asia, and identifies efficient regional transit corridors using linear programming or the Data Envelopment Analysis model. This publication is a contribution by the United Nations Economic and Social Commission for Asia and the Pacific to deliberations at the Second United Nations Conference on Landlocked Developing Countries (LLDCs) in Vienna, Austria, 3-5 November 2014. It shows regional connectivity as an unfinished agenda and bridging infrastructure gaps as a complex challenge for LLDCs. While physical infrastructure is a priority, this report argues that deeper regional integration – through regionally cohesive and terrestrial networks – is key to effectively linking Asian LLDCs to the region’s infrastructure networks. This United Nations Economic and Social Commission for Asia and the Pacific Trade and Investment Working Paper attempts to quantify the potential impact of trade facilitation on foreign direct investment (FDI) flows. The study uses bilateral FDI data from 2006 onward from both developing and developed countries, including South-South FDI flows, wherein contiguity (common border between source and host country) and geographic distance are found to be much more important factors. In applying an augmented FDI model framework to determine the effect of comprehensive international trade costs, the results show that both non-tariff and tariff costs are important determinants of FDI inflows. 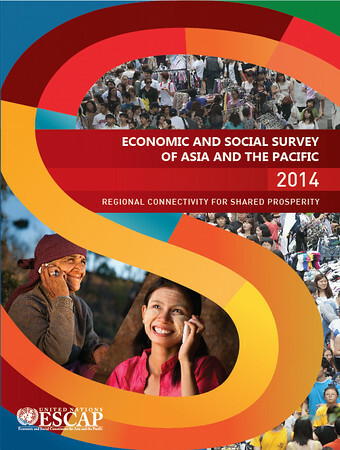 This 2014 edition of UNESCAP's flagship publication emphasizes the importance of furthering regional connectivity in Asia-Pacific—a region which, despite significant reductions in poverty levels, is now witnessing rising income inequality, both within and between countries. It calls for driving the region's growth by exploiting the interdependence and synergies of five elements: trade and transport connectivity, ICT networks, energy connectivity, people-to-people networks, and promotion of knowledge-based economies, and advocates approaching connectivity as a regional public good. Cross-border paperless trade is trade that occurs on the basis of electronic communications and has been part of customs reform efforts in a variety of countries. Increased implementation of cross-border paperless trade is high on the trade facilitation agenda in Asia-Pacific. This report considers six measures to calculate estimates of possible economic benefits of cross-border paperless trade through counterfactual simulations using 2013 data and simple econometric models. Simulation results reveal that this new generation of trade facilitation can significantly reduce trade costs and boost intra- and extra-regional trade in the region. Partial implementation of these measures can lead to an export increase of $36 billion annually. Total direct cost savings across all trade is about $1 billion per annum for partial reform, and $7 billion for full implementation. This paper reports survey findings on progress in implementing various trade facilitation and paperless trade measures made by 29 countries in Asia and the Pacific, including six SASEC member countries. Factors considered include pre-arrival clearance, post-clearance audit, National Single Window, and authorized operator programmes. The survey reveals that while countries have prioritized automation and paperless trade at the regional level, there is an urgent need for regional arrangements that will facilitate cross-border exchange of trade-related electronic documents and information to enable smoother trade facilitation. Freedom of transit is an issue critical to landlocked developing countries whose lack of direct access to the sea has increased costs and lessened their competitiveness in international trade. To meet challenges arising from transit barriers, member states of the United Nations Economic and Social Commission for Asia and the Pacific recommend transit facilitation as part of an integrated approach to trade facilitation. This working paper analyzes freedom of transit and transit facilitation in the context of trade and transport agreements in the Asia Pacific region, identifying good practices and weighing in on the extent to which existing agreements meet the provisions on transit facilitation stated in the draft text of the World Trade Organization Agreement on Trade Facilitation.